Regina Derkintytė – Kaupienė is practicing law since 2000. Through more than decade of work in major Lithuanian and international shipping and telecommunication entities and law firms she has gained invaluable experience in shipping and transport, litigation and arbitration. Regina is one of the best known shipping law experts in Lithuania advising the clients on ship arrests, construction, finance, sale and purchase, mortgages, cargo claims, maritime liens and other related matters. Regina is a licensed bankruptcy administrator, therefore the clients appreciated her in-depth knowledge and experience in bankruptcy and restructuring cases as well. 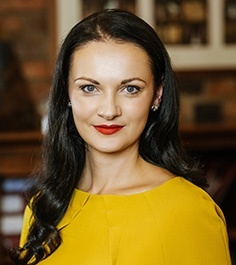 Regina Derkintytė – Kaupienė is included in the list of recommended arbitrators of the Vilnius Court of Commercial Arbitration. She is co-author of the only textbook on international shipping law in Lithuania which is highly praised by local academic society. Regina is often invited to deliver lectures in universities and colleges; she is also a prominent speaker in various conferences and seminars. Legal 500 has nominated Regina as leading individual in shipping and transport in Lithuania. She is “proactive and goal oriented” (The Legal 500 (2015)) and „one of the most competent individuals in shipping” (The Legal 500 (2016)). The clients address Regina not only with legal issues, but also appreciate her advice on business models, internal structures of the companies, changes in activities, restructuring matters as Regina is educated not only as professional lawyer, but also holds Master degree in Engineering Economics and Business Management. Among her recent clients are major Lithuanian transport and shipping companies, banks, insurance companies, associations and unions.